LEGENDS, LORE AND HAUNTING IN MERIDEN with moderator Julie Griffin. Is the Solomon Goffe House (1711) haunted? Are there spirits in the Andrews Homestead (1760)? Julie has been researching, photographing and documenting paranormal legends and activities in the area for quite some time now. Bring a friend to this spirited meeting. The Meriden Historical Society sponsored a digital preservation event to help individuals preserve personal collections of print, photos and other media materials by having them digitized at a reasonable price. Digital Memory Media advisors were on hand at the Society’s Bernice Morehouse Research Center to advise and pick up old slides, photos, family VHS videotapes etc. We thank all who have stopped by and brought in their items to be digitized. Notifications will go out as soon as we know the date when the digitized materials as well as the originals will be available to be picked up. On the pick-up date, representatives of Digital Memory Media will be on hand to assist and collect material to be digitized from those who missed the October 22nd event. Our heartfelt thank to our member Ruth Grandy for loaning us her late husband’s mounted Meriden Postcards collection. 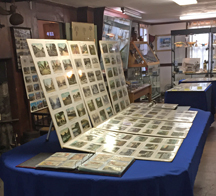 Roughly 100 people stopped by to view the spkecial Meriden postcard disply and view our permanent display of Meriden’s history and industry. We were especially pleased to host the 4th and 5th grade students of the Ben Franklin Elementary School, their teachers and chaperones. We conducted 6 tours for about 120 students. The students visited the Andrews Homested over a period of 2 days as part of their social studies curriculum. Kudos to teacher Terence Ayrton for arranging the visit.